All of our activities can be used for team building days but we also have a collection of other team building games available for indoor events and outdoor events. We can also tailor any of our challenging activities such as our mobile climbing wall to enhance team work through blind fold rock climbing. Alternatively, we can create tournaments with our team activities such as inflatable laser tag or human table football. Below are some examples of team building puzzles and icebreaker games that are for hire at indoor and outdoor team building events. 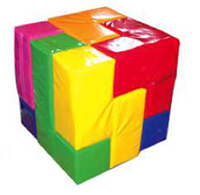 The Soma Cube is a team building or icebreaker puzzle consists of different shaped pieces that fit together to create a large cube. This puzzle sounds easy, but can be extremely difficult when against the clock. 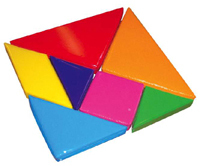 The Tanagram puzzle consists of seven flat shapes called tans which are put together to form different shapes. The idea of the puzzle is that participants are given an outline or silhouette of a shape and they must use all seven pieces to create the shape without the shapes overlapping. 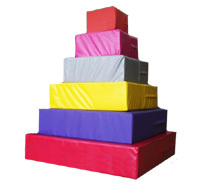 Towers of Hanoi is brightly coloured pyramid which is a massive 1.4m tall. The aim of the puzzle is to move the tower, one piece at a time from the start to the finish using as few moves as possible. This sounds easy but once you follow the rules you will see the puzzle becomes far more interesting.